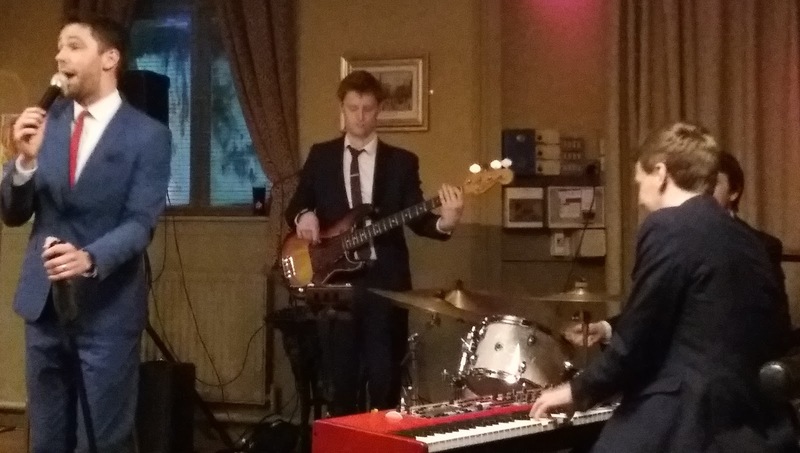 It was a rainy night in mid-Northumberland as the Paul Skerritt Band returned to Ashington Jazz Club some thirteen months on from a successful appearance at the Elephant public house. Jazz fans in this part of the world like Paul Skerritt and the boys and nonstop rain wasn’t to deter them. The upstairs room of the Newbiggin Road hostelry filled up nicely as vocalist Paul Skerritt took to the stage right on time. Skerritt’s professional approach is part of the package and with his fellow musicians booted and suited a poignant opening number, What a Wonderful World, remembered two stalwarts of the regional jazz scene – Ashington Jazz Club’s co-founder Bill Stafford and the highly respected multi-reedsman Derek Fleck who performed at the club on many occasions. From Curtis Stigers to Nat Cole to Lerner and Loewe’s Almost Like Being in Love, Skerritt knew what the audience wanted and duly came up with the goods. The quartet is one of friends as Paul has, seemingly, established a telepathic relationship with pianist James Harrison. They play with a sense of fun, but don’t be fooled, the musicianship is of the highest quality, and that goes for Anth Ord, bass, and drummer Tom Chapman. Amiability, good times, they’ve got it in spades, however, Gregory Porter’s committed, passionate Take Me to the Alley revealed another dimension to Paul, James, Anth and Tom. Their collective sensitivity in interpreting Porter’s song – with pianist James Harrison crafting a masterful solo – confirmed they can play heavyweight material when required. Harold Arlen’s It’s Only a Paper Moon followed by Bill Withers’ Ain’t No Sunshine offered yet more evidence of the PSB’s ability to switch from wonderful GASbook frivolity to the heart-felt lyric: Ain’t no sunshine when she’s gone. Marvin Gaye (How Sweet It Is), typical, welcome fayre, then to end the first set, a mega-pop hit – Taylor Swift’s Shake It Off – featuring James Harrison’s Teesside, as opposed to Harlem, stride piano playing. And would you believe it, Skerritt opened the second set with another huge chart success?! But wait…there was the little matter of the all-important interval raffle and your reviewer’s companion drew the winning ticket for one lucky Northumbrian jazz fan. Those of a Postmodern Jukebox persuasion would have been up and onto the dance floor as Paul and the boys launched into their second set with Meghan Trainor’s global hit All About That Bass. Our frontman hit Ashington’s sweet spot singing the verse to Fly Me to the Moon (…in other words, baby, kiss me) then stood to one side, casually leaning Rat Pack-style on his mic stand, as the trio stretched out in swinging style. Sway, Orange Colored Sky, the Elephant’s audience lapped it up. Tom Chapman featured on I’m Beginning to See the Light – TC is on the list of top rate drummers working across the region and further afield. Skerritt kidded the band that he’d take The Lady is a Tramp at a ridiculous lick, counting them in: ‘Two, three four’ – only to relent, but, no mistake, they, were ready for it, but he was joking, neatly referring to himself as the ‘gentleman’ being the ‘tramp’ and, as if to prove a point, the trio briefly went double swing time – these boys can play, big time! 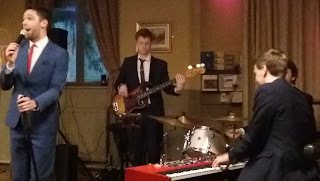 Time was pressing, and true to form, the Paul Skerritt Band obliged, finishing its set right on time with a stylish Puttin on the Ritz and the ‘having a good time’ closer Let the Good Times Roll. This evening was a wonderful tribute to the AJC in celebrating 36 years presenting great music from Jazz musicians in the North East.